The Metropolitan Cathedral is without a doubt one of the most important buildings in Mexico City’s historical center. Beyond its religious significance, it contains a summary of five centuries worth of Mexican art and architecture. Built on the remains of an Aztec temple in what was the center of the Aztec capital of Tenochtitlan, the colonizing Spaniards built the most grandiose church in all of the Americas. Its imposing size, its fascinating history and its beautiful art and architecture make this one of the most outstanding buildings in the country. 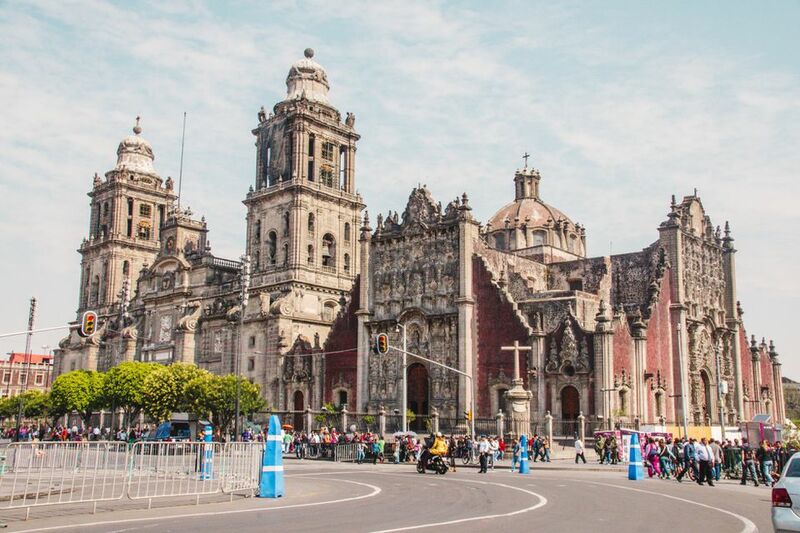 The cathedral is the seat of the Archdiocese of Mexico and is situated on the north side of the Zocalo, Mexico City’s main square, beside the Templo Mayor archaeological site, which will give you an idea of what this place was like before the arrival of the Spaniards in the 1500s. When the Spaniards leveled the pre-Hispanic Aztec city of Tenochtitlan and decided to build their new city upon it, one of the first priorities was the construction of a church. Conscious of this, the conquistador Hernán Cortes ordered the construction of a church and assigned Martin de Sepulveda the task of building it on the remains of the Aztec temples. Between 1524 and 1532, Sepulveda built a small east-west facing church in the Moorish style. Some years later, Carlos V appointed it the cathedral, but it was inadequate for the number of worshipers and deemed too modest to serve as the cathedral of the capital of New Spain. A new construction began under the supervision of Claudio de Arciniega, who drew inspiration from the cathedral in Seville. The foundations of the new church were laid during the 1570s, but the builders encountered various challenges that slowed the project’s conclusion. Because of the soft subsoil it was determined that using limestone would cause the building to sink further, so they switched to volcanic rock which was resistant and much lighter. A terrible flood in 1629 caused a delay of several years. The main construction was completed in 1667 but the Sacristy, bell towers and interior decoration were later additions. The Sagrario Metropolitano, on the east side of the main part of the cathedral, was built in the 18th Century. It was originally designed to house the archives and vestments of the archbishop, but now serves as the city’s main parish church. The relief above its entrance and the mirror-image portal on the east side are excellent examples of the hyper-decorative Churrigueresque style. The monumental structure is over 350 feet long and 200 feet wide; its bell towers reach a height of 215 feet. The two bell towers contain a total of 25 bells. You’ll notice a combination of different styles in the architecture and decorations, including Renaissance, Baroque, and Neoclassic. The overall result is sprawling yet somehow harmonious. The floor plan of the cathedral is a Latin cross shape. The church faces north-south with the main facade on the south side of the building, with three doors and a fenced atrium. The main facade has a relief showing the Assumption of the Virgin Mary, to whom the cathedral is dedicated. The interior consists of five naves with 14 chapels, sacristy, chapter house, choir and crypts. There are five altarpieces or retablos: the Altar of Forgiveness, the Altar of the Kings, the main altar, the Altar of Resurrected Jesus and the Altar of the Virgin of Zapopan. The Cathedral’s choir is richly ornamented in a Baroque style, with two monumental organs and furnishings brought from the Spanish Empire’s colonies in Asia. For example, the gate that surrounds the choir is from Macao. The crypt of the Archbishops is located below the Altar of the Kings. Unfortunately, it is generally closed to visitors, but it is noteworthy that all the former Archbishops of Mexico are buried there. Some of the most beautiful paintings within the cathedral include The Assumption of the Virgin— painted by Juan Correa in 1689—and the Woman of the Apocalypse, a 1685 painting by Cristobal de Villalpando. The Altar of Kings, exquisitely sculpted by Jerónimo de Balbás in 1718, is also outstanding and contains paintings by Juan Rodriguez Juarez. The cathedral's obviously uneven floor is the result of the building sinking into the ground. The effect isn't restricted to the cathedral: the whole city is sinking at an average rate of about three feet per year. The cathedral presents a particularly challenging case, since it is sinking unevenly, which ultimately may threaten the survival of the structure. Various efforts have taken place in order to save the building, but since the construction is heavy and built on uneven foundations and the subsoil of the whole city is soft clay (this was formerly a lake bed), preventing the building from sinking entirely would be impossible, so efforts center on evening out the foundation so that the church will sink uniformly. The Metropolitan Cathedral is located on the north side of the Mexico City Zócalo, at the exit of the Zócalo metro station on the blue line. Hours: Open from 8 a.m. to 8 p.m. daily. Admission: There is no charge to enter the cathedral. A donation is requested to enter the choir or sacristy. Photos: Photography is permitted without the use of flash. Please take care not to disrupt religious services. Tour the Bell Towers: You can purchase a ticket for a small cost to climb the stairs up to the bell towers as part of a tour that is offered several times daily. There is a stall inside the cathedral with information and tickets. The tour is only offered in Spanish, but the view alone is worth it (if you’re undaunted by the steps and not afraid of heights). Earthquakes in fall of 2017 caused some damage to the bell towers, so bell tower tours may be temporarily suspended.